Earlier this month we had the pleasure of attending The Power of Volunteering conference in Zagreb, hosted by the Croatian Volunteer Development Centre. Volunteer involving organisations, volunteers, and government officials from across Croatia were present along with volunteer development agencies from Denmark, Slovenia, Ireland and the European Volunteer Centre. The conference provided a wonderful opportunity to learn from our peers in Europe, as well as a chance to share our own learning, challenges and best practice examples in volunteering. Topics explored included the legal framework for volunteering, impact measurement tools, societal trends in volunteering and national volunteer days. Volunteering is strongly encouraged in primary schools in Slovenia with an aim to build more formally on this tendency. Recently 600 teachers were trained to deploy an anti-bullying programme with students as volunteers – it proved to be very successful in decreasing bullying within the schools involved. Most importantly the students that were recruited as volunteers were not typically the most active participants in school and the volunteers themselves gained so much from being involved in the programme. A new study of 14,000 Scandinavians shows that those who are engaged in volunteer work at least once a week are twice as likely to have a thriving mental health. 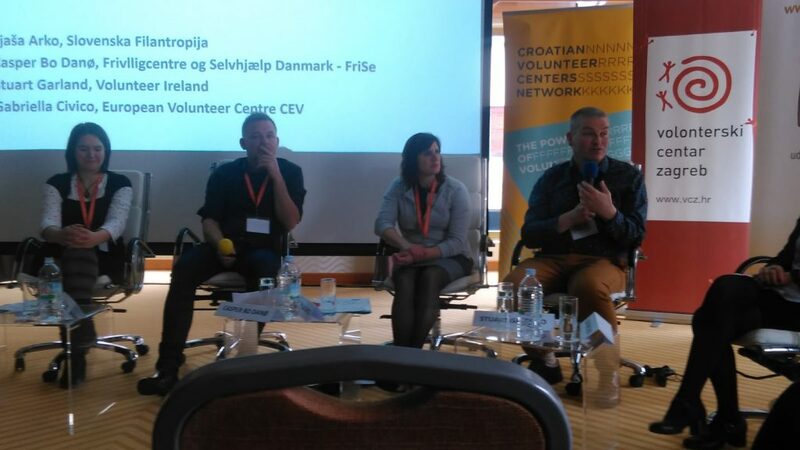 Volunteer Ireland participated in the panel discussion, “Legal Frameworks for Volunteering” along with volunteer development agencies from Slovenia and Denmark and the European Volunteer Centre (CEV). Interestingly, neither Ireland nor Denmark have laws regarding volunteering, however both countries have a stronger state supported infrastructure to support volunteering compared to Croatia. We had a great discussion on the pros and cons of an established infrastructure. Panellists explored the idea that those countries that are still trying to develop an adequate infrastructure, like Croatia, are at an advantage for it can be easier to build something new than to try to adapt and change a structure that is already in place! seek support from organisations that work with and support those underrepresented groups you are seeking to involve. It was so interesting to hear about the different trends, policies and practices across different countries and to learn a little about why these differences exist – our political history, our economic situations, our demographics and our civil society infrastructure. But as always, when we come together as colleagues in the world of volunteering to share and learn, we realise there are core values that we all have in common – our desire to make volunteering accessible to all and our belief in the inherent value of volunteering for the individual, the local community and society at large.